Green is the Colour … of beer! More about green from Michigan in Pictures. I think that for St Patrick’s Day next year I will brew some green beer. I looked all over for information about how to make green beer. I found that (gasp) you could use a few drops of green food coloring. Much as I love food coloring, I thought there had to be a better way. I searched and searched and mostly found out about green (as in energy) breweries. It’s surprising to me that I couldn’t find a recipe for naturally brewing green beer, considering how many foods are green. I thought about a number of options, but settled on using something I only learned about yesterday. Wikipedia sez that Matcha is a variety of fine, powdered green tea used particularly in the Japanese tea ceremony, as well as to flavour and dye foods such as mochi and soba noodles, green tea ice cream and a variety of wagashi. I got mine from Angela at Light of Day Organics and I plan to use it in the same way that I used to use when brewing coffee beer. Steep about 100-150 grams (1/4 to 1/3 cup) of matcha in a quart or so of water. I will use 150 I think to be sure about the color. Brew beer as normal (I will try for a lighter ale with lots and lots of hops). At the end of the mash, strain the steeped tea into the wort and then hope it’s green enough. If not, there’s always the food coloring and the next year! 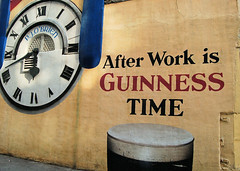 Until then it’s probably a Guinness or a fine Michigan microbrew! The photo is After Work…?! by Jim Crocker and I think that it probably is. Many a beer lover may dream of having free beer on tap at home. That dream came true over the weekend for Haldis Gundersen of the western Norwegian city of Oslo, reports said on Monday. “I thought I was in heaven,” Gundersen told the online edition of Verdens Gang after experiencing how beer flowed freely from every tap in her apartment on Saturday evening. Heaven turned out to be hell at the Big Tower Bar, located two floors under Gundersen’s apartment: water, not beer, flowed out of its beer taps. Brewery experts were summoned and discovered the cause of the fault. “I was going to change beer tanks and of course I connected them wrongly,” bartender Ann-Mari Rande (31) said. Note: I kind of heisted the St. Pauli girl from St. Pauli. I feel terrible about it but really, the story demanded it.